The Yankees and Mets are scheduled to wrap up the 2018 Subway Series tonight, though Mother Nature may interfere. The weather forecast does not look good. There’s rain in the forecast from basically right now through Tuesday. It is only scattered showers for a few hours though, so maybe there will be a window to play? No idea. Like I said, it’s going to rain tonight. Scattered showers at first before the showers become not-so-scattered. First pitch is scheduled for 8:05pm ET and ESPN will have the Sunday Night Baseball broadcast. Enjoy the game if they play. Injury Update: Clint Frazier has been transferred from the Triple-A 7-day DL to the MLB 10-day DL for some reason. He is going through the league’s concussion protocol. Frazier got hurt diving for a ball in Triple-A earlier this week which usually means he goes on the Triple-A DL. Maybe he has to go back on the MLB DL since it is his second time going through the concussion protocol this season? Not sure. Whatever. Frazier is now collecting big league pay and accruing service time, which is why this matters. Roster Move: Domingo Acevedo was sent down following yesterday’s game and Gio Gallegos was called up today, the Yankees announced. I guess the Yankees don’t believe they need another long man anymore. 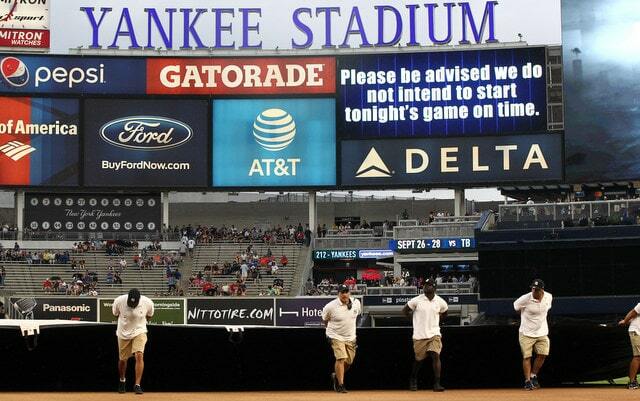 Update (7:30pm ET): The game is in a delay and will not start on time, it was announced. No word on a start time yet. Might not ever get one given the forecast.